She's a philanthropist, mother and half of the world's most generous couple. 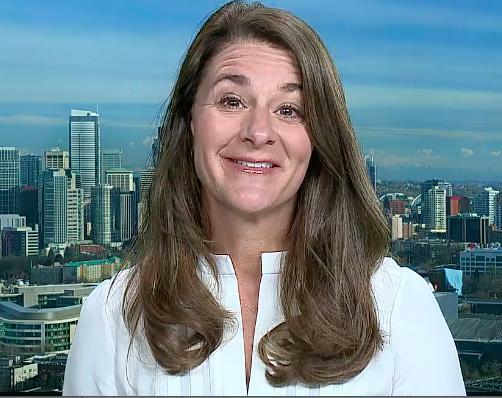 Melinda Gates and her husband, Bill, have tackled numerous global issues through the Bill & Melinda Gates Foundation. Since the foundation's inception in 2000, they have given over $30 billion dollars to fight disease, prevent the spread of HIV and foster agricultural development. Melinda joined me today from the Gates Foundation's headquarters in Seattle to discuss a top domestic priority — education. This week, Bill and Melinda Gates celebrated teachers through a series of blog posts and video interviews on GatesNotes.com. It's all part of Back to School week and wraps up with a big announcement in support of DonorsChoose.org — an online charity that accepts donations to directly fund classroom projects. The Bill & Melinda Gates Foundation is matching up to $1 million of donations today, August 22, through Sunday, August 24. "Teachers do this incredible job with our kids in the classroom. And yet so often they spend … over $400 of their own money on classroom supplies, technology and books. And DonorsChoose helps support that so teachers don't have to do that," Melinda said. Melinda also reiterated her support for the Common Core initiative, launched in 2010, to standardize math and reading achievement for grades K-12. Although initially adopted by 45 states and the District of Columbia, Common Core implementation has fallen under heavy criticism, and several states dropped the standards this year. "This is really critical if kids are going to learn what they need to know to go on to succeed in college and in society. Despite some public confusion about Common Core … teachers are telling us that these standards are actually the right ones. …We know this works. We just need to stick with it for a bit more time," she said. And since the Gates Foundation is so invested in global health issues, I asked Melinda her thoughts about the recent Ebola virus outbreak in West Africa and the experimental drug ZMapp, which is in such short supply. The crisis "points out inequities around the world, " she told me. "We need to build these primary health care facilities so that people have great access to health care, so [that] no matter what infectious disease comes up there are drugs readily available and medical personal readily available to help them." For a woman who just celebrated her 50th birthday by taking part in the ALS Ice Bucket Challenge, she certainly has a lot on her plate. By the way, a big thanks to Melinda for nominating me for the ice bucket challenge — something I proudly accepted. Remember, head to www.donorschoose.org/gatesbacktoschool this weekend to donate.